Vittles has been on my "I Desire" list for quite a long time now, and we finally found time to have dinner here. If you don't drive, you probably got to take a bus from Yishun MRT, like 171 or 169. Vittles is reputed for quite a few of its dishes, one notably credited to a famous food blogger Dr Leslie Tay through the "Ieat Burger". This burger was specially created by the chef for him, and is now one of Vittles' best-sellers. A great thing about Vittles is the free popcorn that it has for diners. I love popcorn and it was a great appetiser and dessert for me hahaha. I need to remind myself that this is essentially a steak rather than a usual beef burger. While both are beef (duh), a steak would naturally be leaner and less like a patty (again duh). 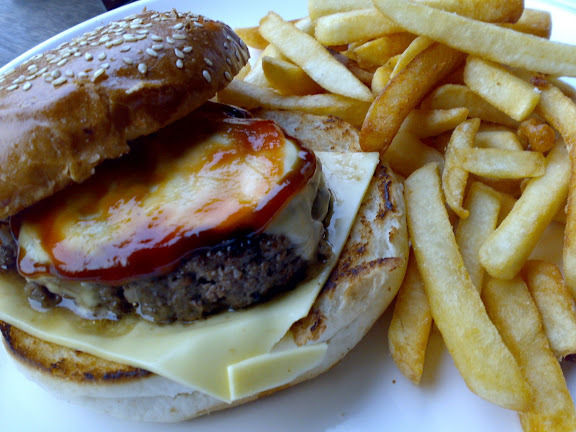 But that could somewhat reduce the "beefiness" of the burger as compared to minced patties in, for instance, e. Blackboard. The sauce used in this burger is really good, and the steak was tender. I didn't want coleslaw, so that explains for the huge chunk of fries you see heh. The chicken was very good, I savoured that one bite that Daphne gave me. Crispy and flavourful. A thicker piece of chicken would be better though. Prices subject to 7% GST; no service charge. 1. Both GST and service charge used to be waived, but GST is now charged. We're not really complaining. 2. Has a breakfast menu as well. When I was young, I remember my parents used to take me and my younger sisters to Sanur Indonesian restaurant for dinner, though that restaurant hasn't been able to shine much in recent years. I don't even know if it's still around at Causeway Point or Ngee Ann City. I like to think however, that Tambuah Mas has done a pretty decent job taking its place, and it's beginning to be one of me and the girlfriend's "place to go" whenever we are craving Indonesian food. You can read more about our previous experience here. Bitter sort of Indonesian crackers which the girlfriend enjoyed very much. I helped myself to the crispy peanuts, munching happily away. We thought this is complimentary though, but it came up to $1.50. Tahu Telor is something like fried tofu in egg batter (hence tahu=toufu, telor=egg) and it's one of the most popular Indonesian dishes here in Singapore. Our main motivation for coming back to Tambuah Mas is this very dish. Whether or not we were hungrier than before, the tahu telor tasted even better, more crispy on the outside, but thick with soft tofu inside. Yums! I found this to be pretty good, though it would have been better if the gravy was thicker, as it is at a lot of Malay stalls. Nonetheless, it went very well with my "nasi kuning" ("yellow rice", which is coloured glutinous rice). Chicken was very fresh and tender too. This is our staple dish I realised. Spicily good. Very polite and attentive. In contrast to the increasing number of restaurants that charge for iced water, the staff here seem more than willing to serve us water, coming frequently to refill our glasses. And oh, rice is on free refill too, and they keep asking me if I had wanted more (even after my second helping!). Thumbs up. Prices subject to the usual 7% GST and 10% service charge. 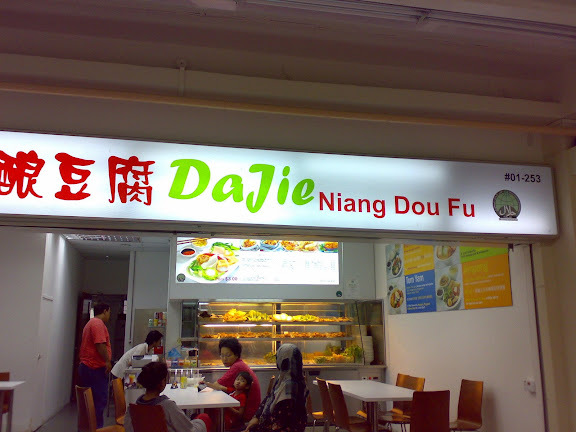 For many NUS students, especially those staying in halls or campers during orientation camps, Niqqi's one of those favourite haunts in the middle of the night when stomachs rumble or mouths yearn to munch or sip on something. More affectionately known as "Fong Seng" (from the name of a nearby Nasi Lemak shop that has a sort of "alliance" with Niqqi's in which both allow customers to eat food from either place and sit in their areas), Niqqi's is open 24-hours. Although it is on friendly terms with Fong Seng Nasi Lemak, Niqqi's has its own nasi lemak on offer here too, but tries to distinguish it by saying its standard-fare nasi lemak as compared to the one at Fong Seng where there's a variety of ingredients to choose from. I like the nasi lemak at Niqqi's because the chicken wing is good, and the sambal is not as sweet as Fong Seng's. As I've always said time and again, taste is after all subjective. A couple of my friends like this, but I don't think my taste buds like it at all. 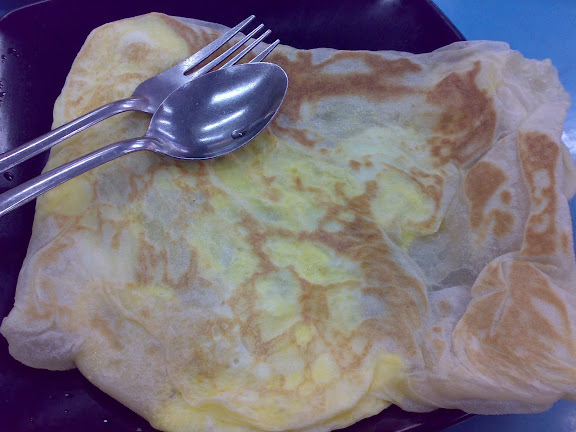 It's a roti prata with egg, cheese and mushroom filling, and at first bite I was already wincing at the salty-type of taste from the cheese. I dumped sugar on it and ate it like a sugared doughnut haha. Interesting name, eh? 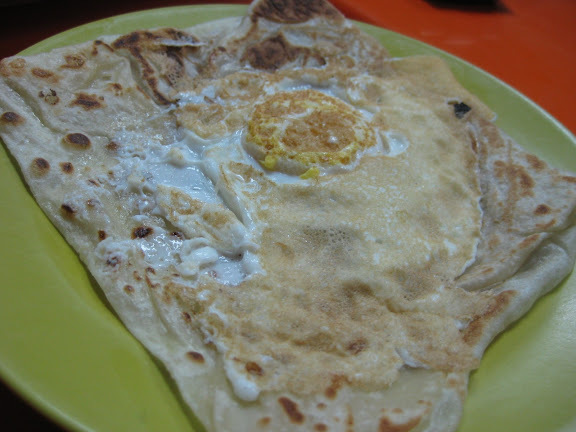 It got its name from the way that the egg is merely "plastered" on the top of a prata without it really being mixed into it like the typical egg pratas. 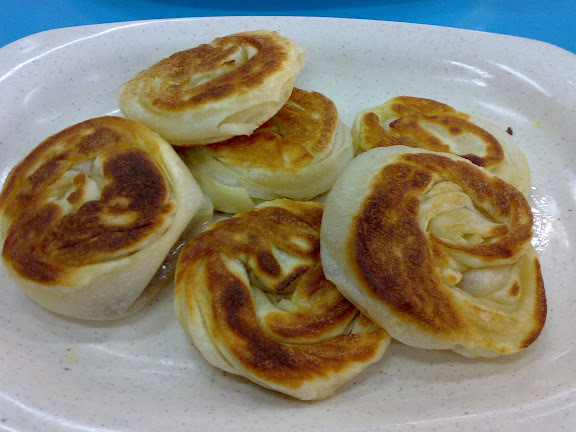 Another one of Niqqi's roti prata variations. Cool down with sweet, iced drinks! 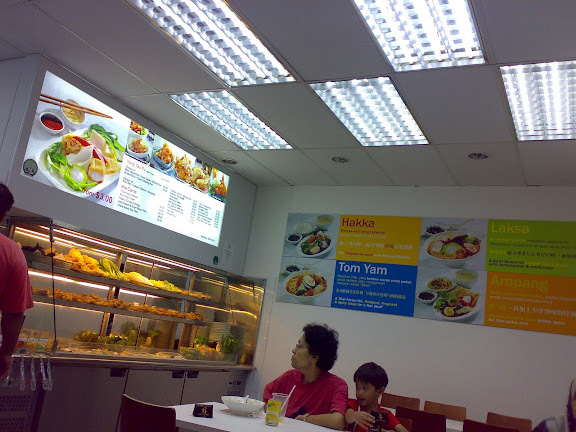 Both me and Daphne were back at our favourite food court in Vivocity, which for a Friday evening was terribly crowded. We had fish soups very similar to the one at the Wisma Atria branch, and golly did we enjoy our dinner. The stalls come by a same name by the way: Ed's Fish Soup. I had my usual mixed fish soup, which consists of both fried and sliced fish. The fish was very fresh, and the soup so tasty that I spent a lot of time just sipping it up even after I had finished my rice and the fish. It doesn't have the sort of "fishy" taste, and I believe this is musked by the vegetables, tomatoes and ginger that they add to the soup. Very good stuff. Daphne always has hers with milk, though I could never imagine having milk in my soup. Still, from the look of satisfaction on her face, I can tell she likes her soup as well. Got these from a stall called, "Huat Huat Chicken Wings". Better than the ones sold at Wisma Atria, though the place to go for tender, juicy barbecued chicken wings will always be at East Coast. Some of you may say Starbucks is another one of those symbols of capitalism, another one of those pretentious coffee boutiques that "cheat" money out of people and is only for people who like to "show off". Well, to each his own really, but I really like Starbucks as a place because one, I like the coffee there, especially my caramel macchiato, and two, every single Starbucks staff that I've met is friendly, polite and thoughtful. They will be more than willing to give you a extra cup of water, a couple of them actually gave me free drinks just because I was waiting a minute longer than I should for my vouchers, and some stop to talk to you while you're taking a break from studying. It's these little things that make you feel comfortable and want to go back for more. I've always been curious about this harmless looking thing that has a pretty amusing name to it. What does "ugly" have to do with anything man. Making a small incision and prying open the little puff, the smell of curry spices jumps to your nose and you know this is one spicy curry puff. And it is so, if not just a little wee bit oily as well. But the chicken bits were discernible and the overall taste was not too bad. Have it heated up, and down it with ice cold water. Yums. The great thing about this little fella here is that when heated, some of the chocolate bits inside melt, making it heavenly whenever you hit the chocolate spot (ahem). Very rich chocolate too, just like the Chocolate Muffin. 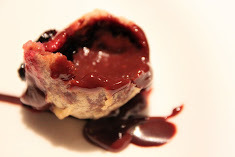 Problem is that some parts of the scone can be terribly dry, making it a bit hard to swallow. Along the Cheong Chin Nam row of restaurants are two large Indian Muslim eateries that sell similar dishes and at pretty much the same prices. For the less discerning they might say that the food taste the same, though I would think that there has to be a bit of difference here and there. I don't actually have a particular preference, though I do find myself visiting Al-Ameen a little more than Al-Azhar. Don't ask me why, I'm not sure myself, other than the fact that Ameen's closer to the public carpark? Ever since I tasted the yummylicious coin pratas from Irfan's, I've been trying to look for the next place that has coin pratas, especially since Kembangan is a little far off for me. The coin pratas at Al-Azhar could really be better, and I'm convinced they would be the next time I return. They were a tad salty and weren't as crispy as those from Irfan's. Probably the cook was rushing since it was a packed evening. I would think it's a similar case as my coin pratas above. 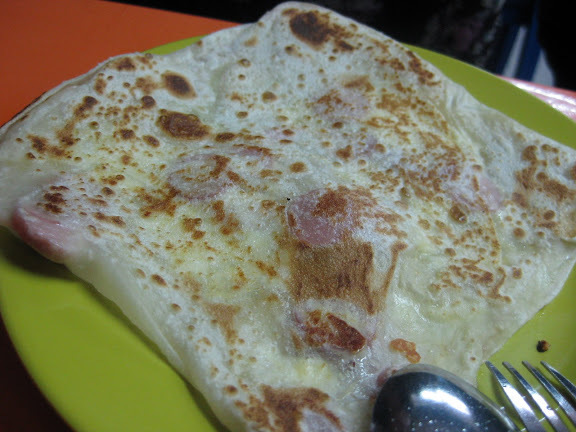 For those who love their normal pratas (meaning plain and egg) absolutely crispy, you've got to go to the absolutely best crispy pratas: The Roti Prata House. 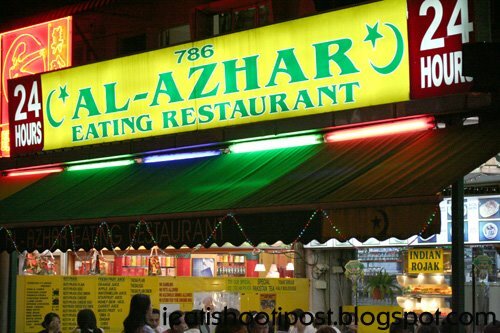 If you're a Singaporean and you have not heard of this place, where have you been all this while man?! My staple drink. "Peng" is... hokkien for "iced" if I'm not wrong. "Teh" is tea in Malay. And well, Cino probably comes from Cappuccino. 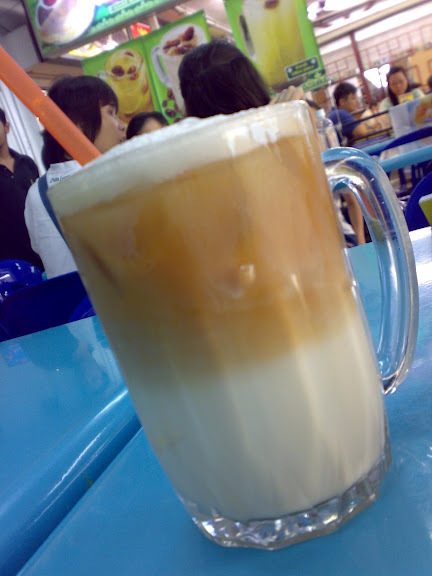 The Teh Cino Peng here is superbly sweet and puts you on a sugar high. I could drink this like a shot. The highlight of Project Cookie Love, a special celebration named by yours truly for Daphne's 22nd birthday, has to be our dinner at Barnacles Restaurant at Rasa Sentosa Shangri-La Hotel. It took me a long time trying to arrange this dinner, but I really have to thank the manager, Ms Angel Lim, who attended to me and was very pleasant and accomodating with all the calls and emails. Thumbs up for service even before we actually stepped foot on this restaurant. The fantastic and amazing thing about Barnacles is really its ambience. 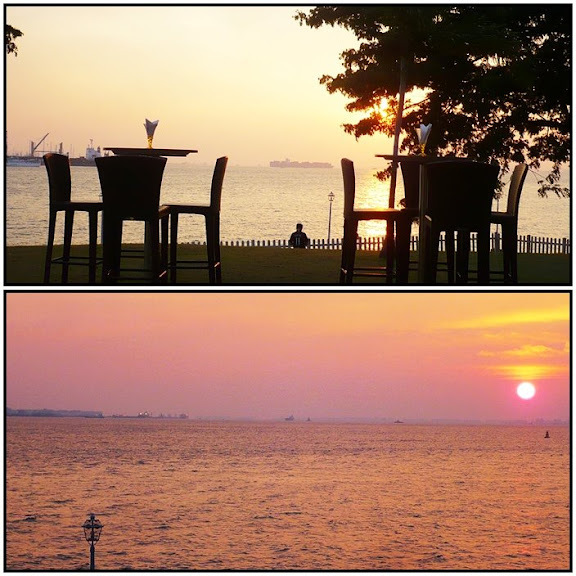 I had reserved a seat on the patio, and my goodness, what a beautiful view we got of the sea and yes, the sunset. The sea breeze was so refreshing and the gentle music playing in the background (and later, by the band) just keeps your mind completely at ease. And when the sun went down, the ship lights came up, lighting up the sea with dazzling colours against the velvety night sky. Simply beautiful atmosphere, and one of the perfect places for a romantic date really. The complimentary bread basket was simply a joy to behold, especially for Daphne who really loves her bread. Dip into one of the two unique sauces - avocado and chilli crab - and you'll be asking for more and more! In fact, I liked the chilli crab gravy so much that they happily gave me a whole bowl when all I asked was a small serving. They even asked us which bread we would particularly like more, all free of charge. This appetiser is voted one of the top ten appetisers in Singapore, and we have no objections at all! The honey crispy squid was sweet and yes, crispily yummy, while the mayonnaise prawns had an awesome "invisible-like" batter that crunches in your mouth. The both of us were joking if we could order ten of this appetiser to fill in as our main course haha. "Grilled beef tenderloin, lamb chop and king prawns with potato gratin dauphinois served with porcini and morel sauce"
I like this picture because it shows how much aesthetic work goes into the food at Barnacles. The potato gratin was so soft and potatoey, and helped to complement the beef tenderloin and lamp chop, which were grilled close to perfection. "Tiger prawns, salmon & butterfish with white wine butter sauce and vegetable ratatouille"
How good can a skewer get? Barnacles shows you how with its freshest array of seafood. The salmon and butterfish were so sweet and good, while the tiger prawns were definitely fatter and tastier than my king prawn. A tad burnt on a few corners, but that's not stopping us from giving this a high rating because of its quality taste. I pre-ordered this and it came as a surprise for the birthday girl. It was amazing how the staff got it done so fast when I told them it was time to spring the surprise, and how they arranged with the band the way we were all going to pop out from behind with me holding the cake, and everyone singing a birthday song. On taste, it wasn't all too bad, but we had to take out the all too generous helping of whipped cream. The tiramisu mousse/cake was sweet, smooth and gets you on a high. Actually, I had pre-ordered a chocolate truffle cake, but they made a mistake and got out tiramisu instead. While it was quite alright to me, I realised later that they had actually decided to waive the cost to us because of the slip up. I called them up to say that I wouldn't mind tracking back on the shuttle bus to pay them, but they were sooooooooo awfully nice about it that you have to really admire Barnacles for its great service and how it values its customers. Prices subject to 7% GST and 10% service charge. Thumbs up to Barnacles Restaurant! Cold Rock Ice Creamery was the first of three food places for my special birthday celebration for Daphne, the other two being Barnacles Restaurant at Rasa Sentosa Shangri-La and PS Cafe at Orchard Palais. It's all part of this "event" that I planned and it is called Project Cookie Love! Like all the "boutique" ice-cream parlours springing up across the island, Cold Rock is no different in having its very own set of unique or house flavours, ranging from Ferrero chocolate to honeycomb to bubblegum. Cold rock ice-cream is really just a way of mixing the different selected flavours of ice-cream with the chosen toppings on a cold slab of rock (although it looks pretty metallic to me) so that you get a real mix of taste rather than eating separate scoops of ice-cream. I think we got exactly what we wanted on try number one. Real chocolatey taste mixed with the sweet milkiness of honeycomb ice-cream, further enhanced with crispy maltesers and sweet M&Ms. A delightful combination that made us decide on getting another cup to share! Of course, we wanted to try something a little different, but I was extremely convinced that it was the honeycomb that contributed to the smooth sweetness to our previous mix. This time I chose Violet Crumble chocolate as our topping, which Daphne approved very much. So, which Mix was our favourite??? Mix One: Dark Chocolate + Honeycomb + Maltesers + Mini M&Ms with a fantastic score of 9.5/10! This simply trashes the disappointing Marvelous Cream ice creamery at Raffles City Link. I think I will only eat ice-cream either from Cold Rock Ice-Creamery or Ben & Jerry's from now on hahaha. Oh gee, although I'm typing this at such a late hour, I'm so having an ice-cream craving now heh! Of course, our mix is our personal favourite but feel free to try out as many flavours and combinations as you like, especially since there's so much to choose from, both ice-cream and toppings. I will only post the food that the both of us had though, since we couldn't possibly go around the big round table snapping away at every single dish that our friends were having. I kinda like the ambience of the place because it has this chic and stylish feel to it, and it's even better if you have a view of the sea. The stewed beef came cold, and I tried to "heat" the beef up by putting it on the warm fried rice. The fried rice, though tasty enough, was a bit too oily for me. Daphne had this, and found the wanton (dumplings) to be quite good as they have "lots of chicken inside". However, she feels the overall taste of this dish is just ordinary, and nothing to shout about. And for those scratching their heads over what it means for "la mian", if I'm not wrong it refers to the way that these noodles are made, "la" being translated to "pull" as these noodles are stretched and pulled to fine strands. Even for a Tuesday night, the restaurant was packed, and it was very difficult trying to get the waitresses attention. I literally had to stand in their way to order, putting up your hand won't help. I was having a burger craving, and immediately suggested this place when my friends were asking where we should have our little gathering. Smok'inn Frogz is really a kitchen within a small pub called Bar Bar Black Sheep along Dunearn Road, and if I'm not wrong there's two other kitchens next to it, one Thai, the other Indian. This place is pretty popular with Caucasians and a fairly good place to just hang out with a drink and chat the night away. Contrary to my previous visit here, I'm glad that the standards have gone up. Perhaps competition from Brewerks nearby is keeping Smok'inn on its toes. The beef patty is less tough and is also very fresh. I asked for no lettuce and salad all around, which explains for the french fries all over. The waiter smiled and called it a "Kids Meal" when he served it to me haha. Very good, very friendly and polite. I had blogged about this place when the both me and Daphne were here previously, but that was like half a year ago. Nothing much have changed though haha, this place is still pretty quiet as compared to the popular Evertop chicken rice next door. If you want to check what soup base or gravy this stall offers, click on the picture to enlarge it. For the uninitiated, "yong tau foo" is a type of mixed ingredient dish (oftentimes, a soup) where you get to select from a variety (although this variety differs in degree from stall to stall) of ingredients. Our good friend Wikipedia actually has a fairly good introduction of it, if you're interested. I think me and Daphne are quite unhealthy eaters. I normally choose Ampang gravy not only because it's sweet but more because I want my ingredients deep-fried haha. Daphne meanwhile loves her laksa/curry gravy fix for that spicy kick, but that means more coconut milk naturally (see below). The crispy ingredients went pretty well with the fairly smooth gravy. Daphne was quite happy to see her meat dumplings deep-fried as well, because otherwise they would all be soaked in the laksa gravy too. Spicily good, which she likes a lot. One big drawback is that the ingredients seem less fresh than before, and we hope this wouldn't be the case the next time we are back here. Okay, they will serve the food to you. Clementi Avenue 2, Blk 354. This stall is certified Halal.